A learning management system (LMS) is, essentially, a very helpful software designed to manage online learning, instructor-led training (ILT), virtual instructor-led training (vILT), and more. It’s a platform that both learners and administrators can log into to either upload and distribute courses and learning materials, or take courses. LMS software automates the tracking of training, conducts evaluation to assess knowledge retention, and can also collect training data. LMSs can host hundreds of thousands of users and hours of courses and video. This means that the LMS can streamline learning and training for a lot of groups, from academic institutions to corporations to global franchises. A lot of learning and development departments have come to depend upon the functionality of an LMS to keep their training programs running smoothly. Often, LMSs come with full learning solutions, including extended enterprise functionality, compliance-ready features, and continuing education management. The features of different LMS software will cater to different sets of needs, so if you’re considering purchasing an LMS, you need to make sure that the LMS will work for you. As more and more institutions recognize the value of an LMS, the market continues to expand and grow. CNBC claims the market is worth $5.2 billion in 2017 and will grow exponentially in the next four years to $16 billion. Pretty much any organization, whether corporate, academic, or non-profit with a formalized training program can benefit from an LMS. An LMS is designed to make that training organized and accessible, and it streamlines learning and development efforts to save time and money. Internal training – Training on skills specifically relevant to the company, such as company history and values, branding standards, and more. Skills certification – Training on specific skills, whether its software skills certificates, leadership skills, business communication skills, or more. Compliance training – Training designed to adhere to specific laws, such as workplace safety or sexual harassment standards. Onboarding – Courses designed to efficiently and consistently train new employees on the basics of navigating their new workplace. Client/customer training – Training extended to company partners to help them communicate or use products more effectively. Selling courses/training (ecommerce) – This could be any kind of training, but many companies choose to use an LMS to deliver sold courses to customers. While online learning and the LMS may have started as a solution for the education of children, and about a fifth of organizations are still academic (according to Capterra), the rest of the users are a growing number of industries, including technology, healthcare, manufacturing, real estate, and more. Technology is one of the biggest contenders. In company size, those on the highest and lowest ends of the revenue spectrum seem to be more likely to have taken advantage of an LMS to streamline their training, with companies in the middle (interestingly enough) sticking to their old ways for now. What Kinds of Learning Management Systems Are Available? Since there are over a thousand LMS solutions available on the market, some have understandably taken particular niches to meet the varying needs of companies, while others are somewhat generalized. The major ways that LMSs distinguish themselves is appealing to cost, company size, and LMS deployment options. LMSs provide different types of solutions for different budgets and organization sizes. Certain vendors attempt to appeal to certain markets. To get a better understanding of this, check out our Quick Guide to the LMS Market. Low Cost/Small and Midsized Businesses (SMBs) – Low cost LMS vendors aim to sell a solution to smaller businesses who want to stay as budget-friendly as possible. These systems may offer limited features and support in order to maintain their low price point. Some businesses only need limited features – and sometimes those who are new to LMS systems prefer to start with a simple, easy-to-learn system. These systems are often very quick to purchase and begin using. Mid-Market – These LMS vendors appeal to organizations that will have more users and slightly more complex needs than the businesses that want a low-cost LMS. They may have more user capacity and better reporting engines and can handle more complex business needs that require advanced features. At this level, businesses most likely don’t need to extend training to clients or other channel partners and focus mostly on internal employees or a single user group. Extended Enterprise – This is where things can get complex. These LMS vendors support features that appeal to companies that want to extend training to vendors, clients, or other external stakeholders. These vendors may also want HR integrations or compliance training. They may even need software that supports job applications and onboarding. The needs of companies in this sector can vary, so the software that caters to this category is built to handle the most complex training needs. Global Enterprise – This is software for corporations with hundreds of business unit positions globally. Contracts with these vendors are very expensive and usually customized in very specific ways. These companies often have software needs far beyond the standard LMS – few vendors cater to this market. Deployment options essentially answer the question: where is my software located? In a world run by cloud services, LMS companies have taken up the habit of creating cloud-based systems, although other options are still available. SaaS – There is a prediction for huge growth in SaaS enterprise applications, and the e-learning industry has already been hit hard by it. It stands for “Software-as-a-Service”, and it’s a cloud-based system that the vendor hosts so buyers don’t have to maintain it on their own server. It makes for a very quick deployment option and bug fixes are automatically rolled out to users. Private Cloud – Also known as a “single-tenant” cloud, it’s very similar to SaaS except that each client receives their own cloud. Some buyers believe that this system will provide more security, although the evidence on that is debatable. This is often a more expensive option, since the benefits of SaaS speed in installation and update no longer apply. It still makes it quicker and easier than on-premise installation, however. On-Premise Installation – This option is not as popular these days, but some companies still find it necessary to install the LMS software behind their own firewall. This could be due to location or security reasons. This is more rarely offered by LMS vendors and is the most expensive of the deployment options. Some of our clients come to us after dealing with the frustrations of having to send their busy employees across the country for training or trying to mail paper packets of information to restaurant locations and scramble for signatures on forms. They often find that not only does an LMS streamline their most tedious tasks but they can save millions of dollars depending on their updated training methodology. Reducing training-related costs: For those with in-person training programs, instructor travel costs, facility fees, material costs, and possibly even trainee travel costs (if the company pays for training), add up quick. Not to mention, if materials need to be updated then getting the revised training materials to past trainees is another expense. With a learning management system, converting instructor-led training programs into fully online-based training or taking a blended approach can save companies thousands, tens of thousands, or even millions in training-related costs. Training and development ROI: It can be hard to evaluate whether a training program is successful, but with an LMS, features like standard and ad hoc reports help shed light on efficacy. Some LMS applications have features that make evaluation methods like the Kirkpatrick Model easier to implement and track. Keeping up with compliance: Regulations are ever-changing. Assigning compliance paths to all new LMS users and requiring an e-signature at the end of training helps ensure your company stays compliant. Similarly, an LMS makes assigning updated regulation training simple and easy. Providing learning flexibility: Users can access the LMS 24/7, whenever and wherever they want, including on mobile devices. This makes learning more accessible – it will be easier for learners to skill up and learn new things. So not only will learners be more likely to complete training, but they’ll appreciate it and prefer it over sit-in training sessions that are boring and reduce productivity. Learner personalization: Believe it or not, personalizing learning for thousands of learners from one computer desk is possible. An LMS makes it easy for administrators to personalize the look and feel of the learning environment and provide content that engages the learning styles of their users. Learning works best when people can choose what works for them. Administrative efficiency: Run reports on learning data, automatically assign courses, view dashboards with learner overviews – you can do it all from one place via an LMS. This will reduce time in all areas, from course development to maintenance to putting together reports for executives and stakeholders. Greater channel enablement: Whether you have a sales team that needs to go to market faster or have access to just-in-time training, or a network of partners that needs product training, an LMS makes the delivery, management, and reporting of all this extended enterprise learning not only manageable but more efficient. We’ll talk about Extended Enterprise LMSs later. Along with the many ways that a learning management system will help your educational or learning and development department run more smoothly, there are some things that will be difficult and things your department won’t be used to handling. Maintenance – To keep the LMS properly running, there will need to be people in roles dedicated to administration of it. This is especially true once you first get the LMS up and running. There will obviously be some up-front resources needed to get content and users into the system while also setting up geographical and organizational hierarchies, branding, any ad hoc (or custom) reports you might run, etc. After the initial setup, things run much smoother and many occurrences within the LMS can be set to run automatically, i.e. notifications, user creation (if integrating with other systems), reports, certificates, training, etc. Luckily, for SaaS-based LMS applications, there’s no need to worry about the maintenance and upkeep of the LMS itself since the vendor is in charge of updating the software and pushing out enhancements through the cloud. Implementation – While there are some very user-friendly LMSs out there, your team will still be learning an entirely new piece of software. If you’re uncertain if this will be easy for you, be sure to look into the different types of LMS implementation and ensure your LMS vendor is capable of meeting your software training needs. We will touch on this later. There are a number of key LMS features that most clients are looking for. They are available in a variety of LMS software – sometimes not in the low-cost options, but frequently in the mid-market options. 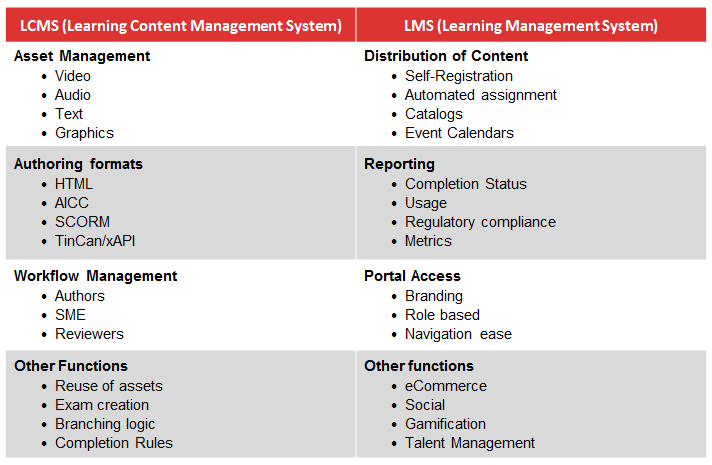 But here are some primary areas to look at when understanding what an LMS can do for you. Reporting Engine – Most LMSs have some kind of reporting engine. The more advanced options include customized data points to be recorded and exportable reports tailored to your needs. Sometimes they can even automatically generate reports and send them to stakeholders. Personalization and Branding – LMS software varies widely in the amount of personalization that can be created in the system. Most software will allow you to upload your logo, but may not have customizable home pages or layouts. Integrations (API) – LMS software will often include API integrations that allow the LMS to work seamlessly with other software in your system, such as HR software. These integrations allow the LMS to have single sign-on, process payments with the software of your choice, pull over user data so they don’t have to make multiple accounts, and other such convenient features. Mobile Support – Most LMSs perform well on mobile devices, which is key since so many workers need the flexibility of training whenever, wherever they want. Blended Learning Support – LMS software sometimes has features that make it easy to integrate other types of learning with learning that occurs within the LMS to make it easy to track. This includes features such as learning record stores, checklists, ability to upload external certificates, student calendars that include both online and in-person events, integration with social learning, gamification, microlearning support, and more. Assessment Options – Most LMSs will provide a way to create tests in order to check for knowledge retention. Some quiz engines will have more complex question options than others – check to see if the LMS’s quiz engine includes question options beyond the standard multiple choice. E-Commerce – If you plan on making payment transactions to sell courses or other items to users of your LMS, then examine the e-commerce options for the software you’re looking at. Content Management – The content management portion of your LMS is perhaps one of the most important. The features in this area can determine what kind of learning content you’re capable of hosting in your LMS, whether that includes video, PDFs, interactive pieces, SCORM courses from third-parties, or more. This portion also determines the way that content is organized. Learning paths should have a lot of features to make them and courses easy to find, such as a good search feature and content tags. Learning paths should also be able to have features that allow learners options in what course they choose to fulfill a learning requirement. Compliance Assurance – A system with compliance features such as audit-ready reports, compliance paths, e-signature options, versioning, and more, will help organizations maintain their compliance and can even automate the process on a monthly, annual, or pre-determined basis. Complex Continuing Education – Managing CE credits can be difficult and time consuming. With the right LMS, however, much of these tasks can be automated, including: reminder emails, recurring training dates, certifications, etc. Other features include the ability to designate the credit amounts for different governing bodies and/or states. Gamification – Now, when you think of gamification, there are multiple ideas of what this term can mean. Some think of this as gamified learning courses, while it can also mean gamifying the learning process through features such as leaderboards, badges, contests, and more. It all depends on what you think will engage your users most. Building a course in an LCMS can be as simple as uploading a PowerPoint or PDF and automatically creating it as a SCORM package. This is the easy way to get into building online courses, but many companies eventually begin creating their own graphics, animations, voice, music, video, text and blend it together to build a course that is more engaging for their learners. It’s a natural progression for most companies to move from PowerPoint to full blown interactive courses and LCMS’s today give you libraries of animations, sounds, videos and interactive tools to work with. The last two, Asset Management and Review Cycles, are probably the most important features for companies that currently create or will be creating a lot of content. The LCMS can tag and organize all of your media assets (video, voice, music, graphics and even text) so that they can be quickly reused in other courses. Multiple authors and SMEs (Subject Matter Experts) can also review the content as it is built, providing editorial and validation workflows. Once the content is built in an LCMS, it’s typically uploaded into a LMS as an AICC, SCORM or TInCan/xAPI package. (We’ll discuss what each of these are in a future blog.) Once in the LMS, the LMS administrator can create a description, add metadata, and assign it to people who need to take the content. But the LMS doesn’t “create” the content. In fact, we frequently get asked if our LMS has an LCMS in it. No, and you don’t want it to either. I’ll go into more detail about why in a minute. Obviously, you can’t have an LMS without putting content into it. And you can’t talk about content and LMSs without knowing SCORM. Sharable Content Object Reference Model (referred to as SCORM) is the method of communication between your content and the LMS. It is what tracks your users and how they interact with the content. All of this data is taken from the content and put into the LMS by SCORM. Access to GPS, accelerometers, cameras, etc. Now, do you need to know everything there is about SCORM or the other methods? Probably not. The authoring tools available make outputting to SCORM a breeze these days. At a high level, SCORM “wraps” content. In other words, you can build a SCORM package of basically anything: a Word or PDF document, video, audio, HTML, really anything. SCORM “wraps” the content so it can track what is taking place between the user and content. SCORM is a great tool in the eLearning world as it facilitates all of the content tracking so an LMS can do its job of distributing and reporting on the content throughout the system. Now that you know about SCORM, let’s discuss where to get that SCORM content from. There are a number of different options based on the amount of time and resources you can devote to content. Some companies prefer to make their own or have someone create custom content, while others may be able to take existing off-the-shelf (OTS) content from third party vendors and use it as is. Third party content, from vendors like Vado, Skillsoft, and Open Sesame, are a great way to rapidly get a library of content for your users to take. Vendors offer all types of content from general soft skills training to market-specific training like OSHA, healthcare or finance. Skillsoft is the 900lb gorilla in the space having acquired a number of smaller players in recent years. They have a vast library of courses available and typically you can find just about anything there. But make sure to check out the smaller players (I’m sure they’ll love that) in the market space. They frequently update their content faster and have better content design that engages the user. Videos – Most commonly used. These can be live action or they can be animated. They create energy and engage the user. Problem with videos are they are time consuming to create and produce so they become out of date in a hurry. Interactive – Gets the user clicking/tapping on the screen to progress the narrative forward. This format is very engaging and highly sought after but there isn’t as wide a variety to choose from. It often includes gamification, one of the most popular elearning trends. PowerPoint style –This is typically a slide-based presentation with a voiceover. If the vendor only has these, you can create something just like it in 2-3 hours using an authoring tool. eBooks – Generally like reading a book or PDF online. This is where the rubber meets the road. Maybe you’ve purchased some 3rd party content but – while it’s meeting your needs – it’s not going to get you where you need to go. Your content needs to be specific to your company and its needs. When you get to this point it’s time to start investigating an LCMS or authoring tool. Authoring tools are a fantastic way of developing content for your LMS. An author can easily take existing PowerPoints, documents, PDFs, etc. and use an authoring tool to wrap them in SCORM. Eventually, you’ll start playing with animations, graphics, questions and answers as well as video and audio. You’ll want to build buttons and interactivity within the content and provide voice overs for your PowerPoints. However, this can also be a downside of authoring tools as they take a level of technical ability. Think of Microsoft Word. Anybody (even my grandmother) can open Word and start typing; it’s that easy. With authoring tools, it’s that easy to convert your existing documents and videos into SCORM. But, Word also has the ability to add tables, graphics, video, audio and build stylesheets, table of contents, headers and footers. It’s the same for an authoring tool. So where do you get all of those great pieces of video, animation and interactive objects so you can put them together into a course? When I started out, I had to create them. This meant having a graphics, video and audio program to capture, create, edit and produce the object. This was the most time-consuming (read: expensive) part of building an online course and I always needed help from a graphic designer, videographer, and/or audio technician. Then I needed to code (yes, code) the interactions so they worked properly. Today, the authoring tool makes it so much easier by providing libraries of templates, animations, and interactions. Be warned, it still takes time and a level of expertise to put all of this together even when you don’t have to build each object yourself. If you create lots of homegrown courses, consider hiring an Instructional Designer or outsourcing it to a Content Developer. Sometimes, like eLogic Learning, LMS vendors will offer custom content services. You may think it’s more cost-effective to do everything internally but it probably won’t be when you factor in how much time you’ll spend. Up to this point, we’ve thrown a lot of terminology and LMS jargon at you. It’s helpful to know what some of the recurring terms you’ll here thrown around in conversations relating to LMSs are, so here’s a short list of some of the most commonly used. LMS – Learning Management System – The reason you are here, right? A software system that distributes content to users and tracks their progress for reporting purposes. LCMS – Learning Content Management System (sometimes also called an Authoring Tool) – A software system to create and manage content and the assets associated with it. API – Application Programming Interface – What developers use to interface the LMS with other systems. There are three “methods” used with APIs. Each method has different pros and cons but your IT folks will know which one they want to use. AICC – Aviation Industry Computer Based Training Committee – A standard used within the LMS to facilitate communication between content and the LMS. This is an older standard when compared to SCORM or Tin Can. SCORM – Shareable Content Object Reference Model – Like AICC and Tin Can, it facilitates the communication between content and the LMS. SCORM comes in two flavors: SCORM 1.2 and SCORM 2004. Additionally, SCORM 2004 has 4 editions to it. CBT – Computer-Based Training – Rarely used term to identify online or self paced learning. CEU – Continuing Education Unit – Frequently used by regulatory/compliance agencies to ensure that users are taking a number of credits each year. There are many different implementations of this in LMS systems. EE – Extended Enterprise – Most LMSs were originally designed to focus on internal corporate training. Extended Enterprise pushes training outside of the corporate walls to partners, distributors, association members and even directly to the public. Extended Enterprise is frequently confused with eCommerce. While eCommerce can be a component of Extended Enterprise, EE specifically deals with being able to separately brand and manage the LMS for different types of users. HRIS – Human Resources Information System – This is typically where your users are stored. This could be an internal software system like PeopleSoft, WorkDay or Active Directory or it could be external like an Association Management system. ILT – Instructor-Led Training – Your typical training in a classroom led by an Instructor. LRS – Learning Record Store – Used by Tin Can to store information on a learner. This works in conjunction or separately from an LMS. OJT – On the Job Training – What I like to call Observational Training. It is a form that gathers information on a user performing a task outside of a computer. There are a multitude of uses for this including grading instructors, validation of a process through a checklist, or gathering feedback by users on how they performed. Basically, OJT in eLearning replaces the pen, paper and clipboard to gather information. PENS – Package Exchange Notification Standard – A standard to tie your authoring tool or LCMS to your LMS so that you can publish content automatically without having to export from the LCMS and import to the LMS. SaaS – Software as a Solution – Also frequently called the Cloud, Hosted, Multitenant and a whole mess of other names. This is where your software runs from. Before SaaS, this was on your company’s servers. Now the software is on a server out in the Internet. vILT – Virtual Instructor Led Training – Also called a webinar. Many customers start off buying an LMS to train their internal corporate employees but soon realize that the system can be utilized to train different entities outside of their company. This can be a Business to Business (B2B) relationship such as partners, channel, resellers, distributors or a Business to Consumer (B2C) relationship where training is given directly to the general public. Some companies have outside sales staffs, contractors, temporary employees and other various departments that may or may not fit within your organization’s structure. The LMS Administrator may want to give limited administrative access to the businesses they want to train so each company can manage their individual users. Or you may want to simply sell your authored training to companies or individuals. All of this falls under the umbrella of Extended Enterprise. What Is Not Extended Enterprise? To peel back the curtain a bit, Extended Enterprise is not a separate piece of software bolted onto the LMS. Nor is it just eCommerce (the most common misconception) or outside training. It truly is a marketing term to identify uses of an LMS outside the traditional corporate world. I’ve seen websites touting such features as multiple branding portals, eCommerce, limited administrative functionality, and more as Extended Enterprise. It’s all that and a bag of chips and if you look closely, corporate training needs all that functionality as well as including eCommerce. So really, what is Extended Enterprise? One of the big ways that LMS vendors distinguish from one another is their implementation strategy and how much hand-holding clients request during software implementation. There are four types of implementation. Self-Service Implementation: This type of implementation is left up to the user, with some ticket support for questions. It’s usually used for cloud-based systems that require only an account to access the system. Self-service implementation is usually free. Assisted Setup: Assisted setup will cost a little money – these packages cost anywhere from $1,000 to $20,000 depending on the level of support and training the vendor is offering as part of the package. Full-Service Implementation: This implementation guides you, step-by-step, through every part of the implementation process, from strategizing to rollout and administration. They might also create custom content or contrive new, unique configurations just for you. This can cost less than $50,000 but can also cost up to $100,000 depending on the company’s complexity of needs. 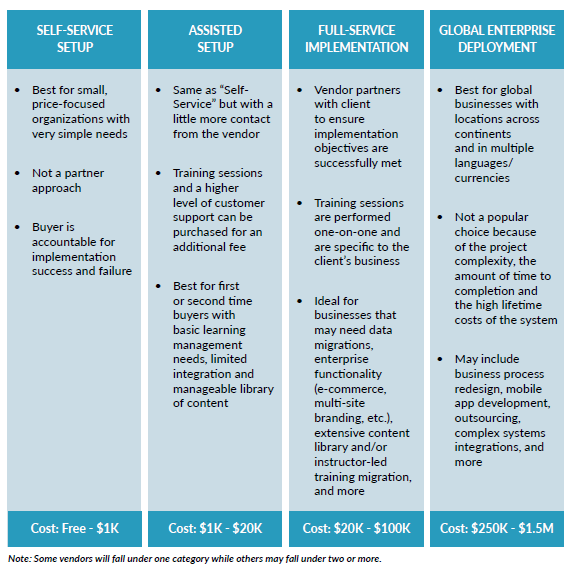 Global Enterprise Deployment: There’s no standard pricing at this level. It’s for the largest, most complex corporations with hundreds of locations across the globe with variable needs that often go beyond learning into talent management and other integration areas. It involves a number of languages and currencies. First thing to know is that buying an LMS is more complex than buyers initially anticipate. According to Capterra, 36% of people think the whole process will take less than three months – but our clients often end up spending eight months to a year. Capterra also says that 59% of people end up lowballing what they end up paying for the LMS. Evaluate your own LMS needs. Do research into available features on the market and make sure to take into account the future of your needs as your training program grows and evolves. Learn about the products on the market. Understand the differences between the major products, including implementation, support, and more so that you know the strengths and weaknesses of each one. This part of the process can involve calls with vendors to discuss your needs and narrow your search down to top vendors. Live demos. View the potential LMS in action with the help of representatives from the vendor. You may also interact with sandboxes and free trials to see what the software is like on the inside. Contract negotiation. The part of the process that involves signing on the dotted line for your brand new LMS. 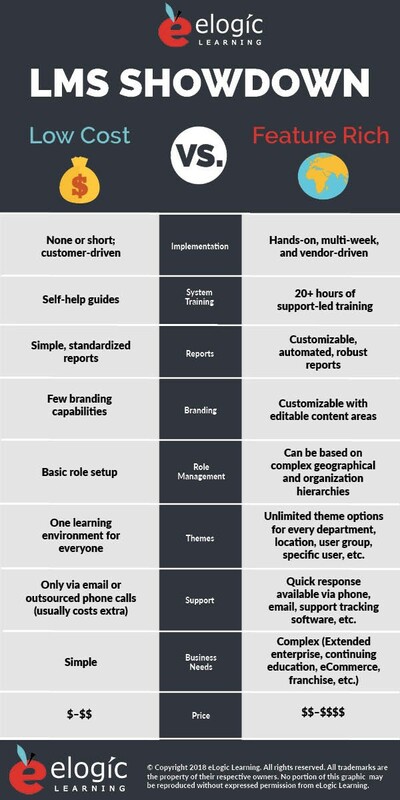 Learn more about each of these steps in detail with our LMS Buyer’s Guide. And, when you’re ready, you can also use our LMS RFP Template and LMS Use Case Scenarios Template to help you start the evaluation process.